If you’ve followed me for a while, you know how much I love using my slow cooker – I use mine at least a few times a week. I like that I can put dinner in it the morning and have it be ready with little effort in the late afternoon. One thing I didn’t like about using the slow cooker was not having the option to brown/saute my meat in it prior to adding everything else to it. I would use the frypan to do that before using the slow cooker, which added an extra step (and more dishwashing). Well, that’s all changed with the Crock-Pot Express Crock Multi-Cooker! The Crock-Pot Express Crock Multi-Cooker is a 12-in-1 multi-Cooker that can pressure cook, slow cook, steam, saute and MORE! What else could you possibly ask for? It does everything and anything you need it to do. Not only do I have the option to brown/saute, but it also cooks up to 70% faster! The option to cook food 70% faster using the pressure cook option will change the way I approach meals. I can literally pop dinner on for the family last minute and have it on the table right on time! There is no need to put the slow cooker on in the morning – with the Crock-Pot Express Crock Multicooker, I can cook with little effort at the last minute. It’s a 12-in-1 multi-cooker that can pressure cook, slow cook, steam, saute and MORE! This recipe is an oldie, but a goodie! It’s super easy, you literally just “chuck” everything into the slow cooker and cook until ready. You can serve this chicken with rice, pasta, tacos or nachos, and it’s freezer-friendly. I’ve cooked this twice now in the Crock-Pot Express Crock Multi-Cooker in under 20 minutes, which makes it a quick and easy meal idea. 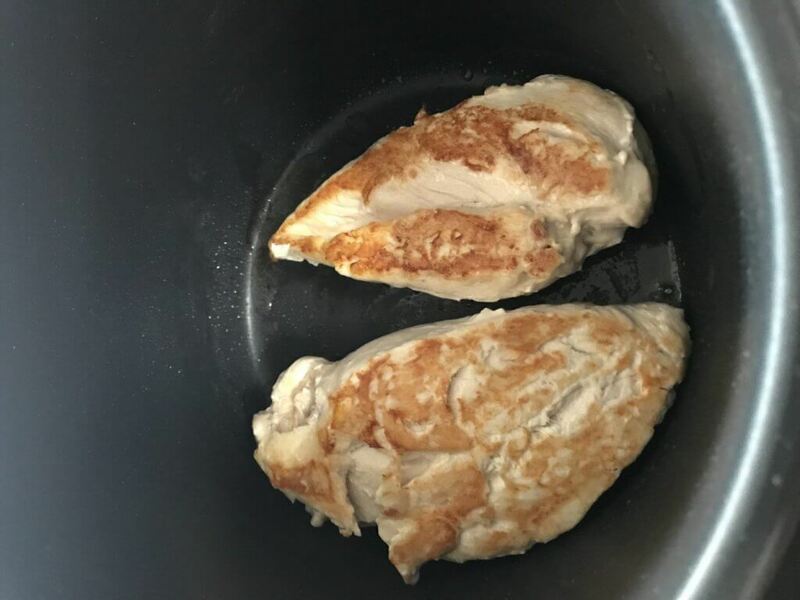 Brown the chicken breasts in the Crock-Pot. Add taco seasoning and jars of salsa. Once cooked, shred chicken with a fork and serve. Pop all ingredients in the slow cooker and cook for around 6 hours until chicken pulls apart with a fork. If you’ve tried this recipe, I’d love to hear what you think of it!